Home Benue News Tiv Nation THE MDZOUGH U TIV REACTS TO THE PRESS CONFERENCE BY THE LEADERSHIP OF MIYETTI ALLAH KAUTAL HORE. THE MDZOUGH U TIV REACTS TO THE PRESS CONFERENCE BY THE LEADERSHIP OF MIYETTI ALLAH KAUTAL HORE. The attention of the Mdzough U Tiv (MUT), the umbrella organization for the economic, socio-cultural and political development of the Tiv Nation, has been drawn to the incendiary press conference held by the leadership of the Fulani Cattle Breeders Association –Miyetti Allah Kautal Hore and published in the Nation Newspaper of Wednesday 31st May 2017. The press conference, from all intents and purposes, was not only inciting and bellicose but full of half truths and ahistorical; intended to aggravate the already challenging security situation in Tivland, Benue State and Nigeria as a whole. The assertion by the group that the Fulanis were the original inhabitants of the Benue valley is absolutely ridiculous, preposterous and complete falsehood. There is neither historical, archeological nor anthropological evidence to indicate that the Fulanis ever inhabited the Benue Valley at any time before the advent of the Tiv people. What is a veritable and verifiable historical fact is that the forces of the 1804 Islamic Jihad led by the Fulani cleric, Usman Dan Fodio, were overwhelmingly defeated at the Ushongo Hills in Tivland. That explains why Islam could not be imposed on the Tiv people nor Emirs appointed to rule Tivland as was the case elsewhere in Nigeria. The recent claim by Miyetti Allah KautalHore that they were in the Benue Valley before the Tiv is not only ridiculous, it is a tissue of lies concocted from the pit of hell to support a desperate and diabolical claim on Tiv ancestral lands. Knowing who the Fulani are and their penchant for changing historical narratives to benefit their designs, we are not surprised. They have severally attempted to hoist a post Jihad narrative of Northern Nigerian identity that seeks to conscript Northern minorities into a monolithic North in which they are a mere footstool for the caliphate. i. Archaeological evidence in the Benue Valley going back to the Early Iron Age at the site of IndyerMbakuv (Tse Dura) excavated and dated by the Late Professor BasseyAndah of the University of Ibadan , Ibadan to 2,300BP shows definite affinities with the Tiv. ii. Additional Archaeological evidence from the Nok site of Katsina Ala also has affinities with other contemporary groups in the Middle Benue Valley including the Tiv. iii. Linguistic, Genetic and Historical evidence indicate that the Tiv were part of the ancestral Bantu stock in the Nigerian Cameroonian border well before the Fulani dispersal from the FutaJalon highlands. The Fulani attempt to change the narrative at this belated time confirms our suspicion that their interest in the Benue Valley is more than the grass they seek for their cattle. The attempt is a devious strategy to secure usufructuary rights to Tiv ancestral lands to be able to exploit the political and religious opportunities that come with such rights. We challenge the Fulani to tell the world where and when the Tiv displaced them in order to settle in the Benue Valley.If they cannot do this, they should in the alternative tell the world where their ancestral lands exist in the Benue Valley so that they can quietly move and establish ranches for their livestock. Their desperate and bloody push for grazing rights across the country for the Fulani of the ‘whole world’ has adverse implications for national security, planning, health and stability. The ECOWAS Protocol on free movement of persons within the sub region does not include the indiscriminate movement of livestock across national boundaries nor does it include the indiscriminate movement of armed gangs masquerading as herdsmen. The coming of Fulani herdsmen in Tivland is a recent development; indeed a post-independence phenomenon occasioned by the climate change- driven desert encroachment and the drying up of the waters of the Lake Chad. Their visits were seasonal aimed at pasturing their cattle during the dry season. The ECOWAS Protocol which allows free movement of the peoples of the West African Sub-region does not in any way allow for wanton destruction of lives, economic livelihood of a people, farm lands, property and engagement in heinous criminal activities. Both municipal and international law guarantee the inalienable rights of a people to life, ownership of property, engagement in meaningful economic activities to ensure their survival as long as such rights do not infringe on the freedom of others. The Fulanis had had a cordial relationship with the Tiv people overtime. Now that they have resorted to criminal violation of the rights of the Tiv people, clearly indicates that they have overstayed their welcome. It must be emphasized that the Fulanis cannot claim to be struggling with the Tiv people over natural resources; which obviously refers to our land. It is axiomatic that the Fulanis are not indigenous to Benue State and thus cannot lay claim to our resources legally or culturally. If this is an attempt by the Fulanis to annex and occupy our land, we are ready to resist this aggression with all the legitimate means that we can mobilize. We inherited this land from our forefathers and we shall protect it for our children and generations yet to be born. The Fulanis are indigenous to several states in the far Northern part of Nigeria and thus have customary rights to land in their respective states. They also have the legal rights and freedom to acquire land for ranching in any part of the country. The Mdzough U Tiv will therefore resist all attempts by Fulanis to annex and occupy our territory. The Mdzough U Tiv also takes a very strong exception to the characterization of the Anti-Open Grazing Law by the leadership of the Mayetti Allah Kautal Hore as “wicked, obnoxious and repressive” which is meant to criminalize the means of survival of the Fulani people and as the “most wicked act any government can do to” them and their economic interest; as most preposterous, conspiratorial and confrontational. The process of enacting this law followed all due procedures. The bill was read several times on the floor of the Benue State House of Assembly; there was a call for memoranda from the public and then a public hearing. Consequently all pertinent views and interests were collated before the bill was eventually passed. The feeling by the leadership of the Fulani herdsmen that the Law was targeted to jeopardize their interest is unfortunate, unfounded and baseless.The main objective of this Law is to bring to an end the wanton destruction of innocent lives of the Tiv people in hundreds of thousands, the monumental and callous pillage of farms and farm produce worth billions of Naira, the unfathomable humanitarian crises and the attendant social devastation of the Tiv society occasioned by the displacement of several millions of people. The consequences of these on the development of Tivland will linger on for several decades. The Law was therefore not aimed at undermining the economic or social interest of the Fulanis or any other ethnic nationality in Nigeria. Consequently the provision in the Law for the establishment of ranches is to forestall the continued devastation of the Tiv nation and to conform with global best-practices for the management of livestock, which is also in the interest of cattle herdsmen. The Mdzough U Tiv strongly feels that the Anti-Open Grazing Law is the best lasting solution that will resolve this perennial problem between Tiv farmers and Fulani herdsmen which has unleashed the worst humanitarian crisis ever witnessed in the life of Tiv society and Benue State in general. While we concede and acknowledge the right of the Miyetti Allah Kautal Hore to legally challenge the Anti-Open Grazing Law, we are most perturbed by their call for total rejection of this Law. Besides they have vowed to mobilize all herdsmen in the country to resist the Law. The bellicosity of this declaration cannot be lost to any discerning mind. Indeed it amounts to a clear declaration of war by the herdsmen on the Tiv nation, and indeed all peace-loving people of Benue State. The Mdzough U Tiv strongly calls on the Ag. President of the Federal Republic of Nigeria,Prof.Yemi Osibanjo, to immediately order the arrest of the President of Miyetti Allah, Abudullahi Bello and the Secretary, Saleh Alhassan and charge them for inciting the herdsmen against the Tiv Nation. If this is not done urgently any breakdown of law and order and further destruction of lives and property by the Fulani herdsmen will be blamed on the Federal Government for not living up to its constitutional responsibility. We call on our representatives in the National Assembly to rise up to the occasion and mobilize national support for the Tiv nation in order to forestall the genocide of the Tiv people and annexation of their God-given land by the Fulani herdsmen. In conclusion, the Mdzough U Tiv wishes to express her strong appreciation to the Governor of Benue State; His Excellency, Samuel Ortom, the Speaker of the Benue State House of Assembly, Rt. Hon. Terkimbi Ikyange, all members of the State Assembly and all those who contributed in various ways to facilitate the passage of the Law. We wish to place on record our untrammeled and solid support for the Government of Benue State over the enactment of this Law and assures her that we shall do everything within our powers to see its successful implementation. 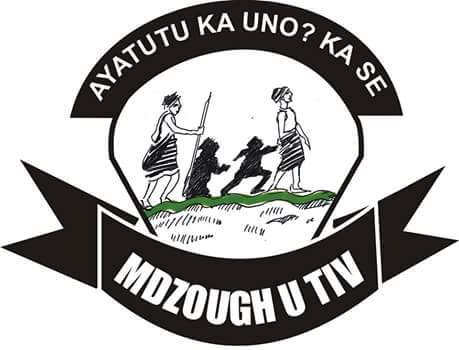 The Mdzough U Tiv calls on all Tiv sons and daughters, their friends and well-wishers, both at home and in the Diaspora to mobilize and harness all possible support and resources to ensure that this Law is implemented in order to safeguard the lives and property of the Tiv nation, and also possible genocide against the Tiv nation but the Miyette Allah Kautal Hore.